Senior Polisario executives were summoned Sunday to a meeting in Algiers with the head of the Algerian government, Abdelmalek Sellal, and the Algerian Deputy Defense Minister and Army Chief, General Gaid Salah. The succession to the head of the Polisario was, according to informed sources at the Rabouni camp, the focal point of the meeting convened while the chief of the Sahrawi Front, Mohamed Abdelaziz, is hospitalized following the deterioration of his health condition. 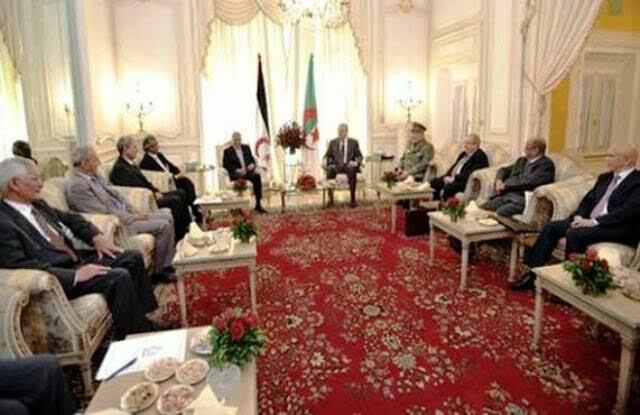 The Polisario delegation was led by the so-called Prime Minister, Abdelkader Taleb Omar, who was accompanied by a number of his close aides. Ministers of Foreign Affairs and of Maghreb Affairs, Ramtane Lamamra and Abdelkader Messahel, both hawks of the Algerian regime, attended the meeting that discussed the latest developments of the Western Sahara issue, according to the same sources. A statement issued by the Prime Minister’s office said during the meeting, which is part of Algerian-Sahrawi consultations, the two delegations explored all possible options, including the military option, in the territorial conflict opposing them to the Moroccan neighbor about the Western Sahara. “These consultations dealt with diplomatic, security and humanitarian issues of common interest”, the statement said. However, according to the sources from Rabouni, discussions focused on the succession of Mohamed Abdelaziz and on the popular protests that shook the Tindouf camps lately. In view of the deteriorating health condition of the Polisario chief, who has reportedly been flown to the United States for treatment, Algerian authorities fear the outbreak of a tribal rebellion in the Tindouf camps, where each tribe seeks to ensure its right to succeed Abdelaziz. Such feuds may weaken seriously the position of both the Polisario and Algeria which is using this conflict as a trump card to impose its leadership throughout the Maghreb and Sahel regions. During the recent events, Morocco scored valuable points on the diplomatic battlefield by turning to its advantage the crisis opposing it to the UN Secretary General Ban Ki-Moon thanks to the strong support it received from several permanent and non-permanent members of the UN Security Council.